Description ScoopFree™ is the self-cleaning litter box you can leave alone for weeks at a time. Simply plug in the box and watch it work. The automatic rake system sweeps waste into the covered compartment 5, 10, or 20 minutes after your cat uses the litter box. The timer will reset if the sa.. Description The ScoopFree disposable litter tray is the reason you can leave ScoopFree self-cleaning litter boxes alone for weeks at a time. 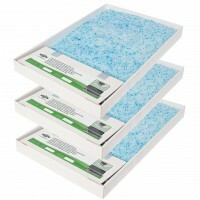 With disposable trays, you don’t have to see, touch or smell messy waste. Simply replace the disposable tray every few weeks and your ScoopFree litter box i.. Description The Pet Loo™ Pet Toilet is your backyard in a box. This portable indoor/outdoor toilet works for dogs, cats and small pets. Ideal for apartments, potty training and occasions when you can’t let your pet out, the Pet Loo™ Pet Toilet is a convenient alternative to pee pads and midnight ba.. Description Liquid Ate eliminates organic stains and odours,unlike other cleaners which only mask the smell. The source of stains and odours are often hidden beneath the surface. Liquid Ate attacks the root of the problem, making your home a cleaner and healthier place to be. The formula contains.. Description The synthetic grass pad is a replacement for the Pet Loo grass. The special fabric is specially designed for the Pet Loo™ Pet Toilet, with small holes to allow your pet’s urine to properly drain into the waste container. The grass only needs to be replaced when you feel it’s necessary. ..